Propolair diffusers work exclusively with capsules by Kontak. The disposable capsules last for up to 122hrs. At the end of their cycle the capsule needs to be removed and substituted with a new one and the diffuser should be reset. 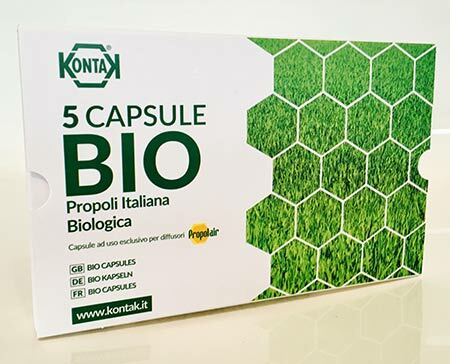 Kontak propolis capsules are made of glass, are ecological and recyclable. To get the best results in the prevention of respiratory diseases and for a full environmental sanitation, we recommend that you leave your diffuser running 24 hours a day. 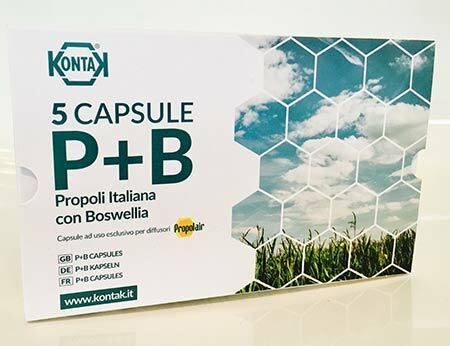 The capsules P + B contain 95% Italian Propolis and 5% Boswellia Serrata, a tropical plant well-known for its anti-inflammatory effects. The combination of propolis and boswellia give a booster effect to the beneficial properties of propolis. Our capsules are now available in an organic propolis version too: enjoy the incredible health benefits of propolis - pure, 100% organi and locally sourced in Italy.